Our library service is committed to helping students discover that special book that switches them on to reading and the life long pleasure of being hooked on books. The NGS library has high quality resources for every subject taught at school and professional assistance to support reading and literacy in school. Food is available under strict hygiene regimen at the NGS cafeteria. A popular place for student get togethers between classes, the NGS cafeteria offers a variety of food choices at very reasonable rates. Bi-ocular microscopes ensure image clarity for high definition study and understanding of biological slides and samples. The NGS biology lab is equipped with the latest binocular microscopes and all the required chemicals and equipment to support the O and A-level programmes. 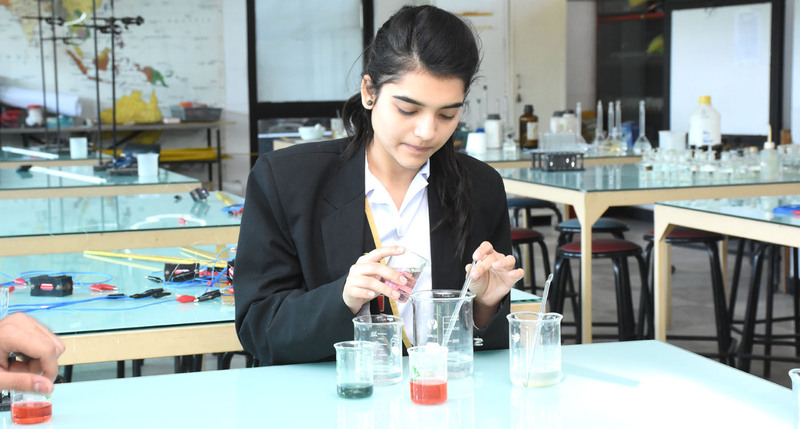 Equipped with imported state of the art equipment, the NGS chemistry lab supports the O and A-level programmes. Special emphasis is given to understanding of safety procedures and practices. All standard chemistry lab safety procedures are strictly followed. The instructor emphasizes on careful check of labels on all the products used in the labs. The equipment in the physics lab at NGS exceeds the requirements for the A-level physics course. The teachers are fully aware of the experiments required for the O and A-level programmes and ensure learning to the highest standard. A high speed 50 MB fiber optic internet connection supports the I.T set up at NGS. The entire campus is covered by Wi-Fi for the benefit of students and staff. The I.T lab remains open till late hours to facilitate student projects. The NGS Career counseling section helps the student to select a course of study that will help them to get into the programme of their choice at the university of their choice. Our career counselors help students to get into a career that is suited to their aptitude, personality, interest and skills.